Written at 08:06:12 on Saturday, 9th December, 2017. Today we buy appliances with the knowledge that in a few months the manufacturer will alter the design, either a little or a lot and either cosmetically, functionally or both. Sometimes this is not necessary and a ploy by manufacturers to build some obsolescence into their products in order to get the market to buy more when an item fails. After two or three years you should expect the parts that went into what you purchased to be superseded by new parts, the older parts no longer made. If anyone thinks this is a modern day habit then they can think again. In the golden age of radio this sort of thing went on in leaps and bounds, just as it does today. It affected people alot less then because things were generally made to last a long time and because of that people didn't throw away what they no longer needed in the house. When companies like AWA and Philips started making transistors people put their valve sets in the shed or garage instead of taking them to the tip. They still worked well so there was no need to throw them away. This didn't stop the manufacturers making small changes through a model's life though. Some changes amounted to simple cosmetic alterations as time went on. 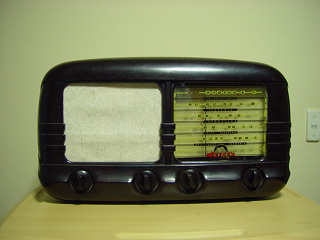 A receiver might have sported a new dial every so often as new stations began operations. A cabinet may have been strengthened due to prior design defects. Functional changes may have meant things as simple as a cabinet's feet may be moulded as an integral part of a cabinet one minute and separate rubber items screwed on the next. Then there were the substantial differences such as offering a 240 volt mains model as well as a set that ran from batteries so that rural listeners could listen in. Below are some of the examples I have noticed in my collection where radio makers have changed things. You be the judge as to whether they were changes for the better or turns for the worst. NOTE: The cabinet on the left sports feet which are moulded as part of the cabinet itself whilst the cabinet on the right, a slightly earlier build, sports rubber feet which are glued on. This is not all that differentiates these Radiolettes. Over time, AWA changed the layout of the chassis quite dramatically, and everything ends up virtually mirror-reverse which the following photos show. NOTE: The power transformer is on the right in the first photo. The power cords are on the same side as the power transformer in each model, a sign that economies of scale were pondered on at the time. I believe that the white set on the left is the later model of the two. 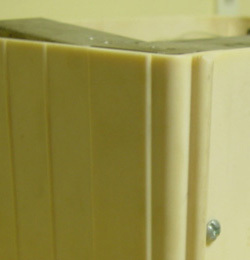 The small post office licence transfer on the white receiver along with the fact that not having moulded feet on a Bakelite cabinet means that a task can then be removed from the production process which in this case was gluing rubber feet onto the set. The plastic covered flex on the white set was placed there by me and when I restore it I will certainly be using something more authentic in its place. The Astor sets described here were strongly built and probably very expensive too. The cabinets are very thick and everything outside and inside is laid out in a luxurious and spacious fashion. We feature three sets here, the first two are mains powered and the third is a battery powered set which runs from a 4 volt A battery for the valve filaments and a 63 volt B battery. NOTE: The first set is probably the most recent of all three because it has a plastic dial and follows a convention of the late 1940's where, especially in small sets, the dials were more relevant to the State the radio was sold in, rather than showing stations for the whole continent. In no other product is Federalism more prevalent! 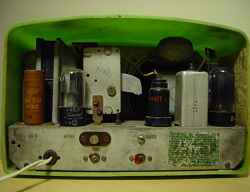 The first receiver pictured above is a 240 volt model and has four valves. It's quite a large cabinet for a four valve chassis though after about 50 years, this set still works and puts out a respectable volume on all local stations. The second set has a five valve chassis. I've never got around to plugging this one in, though I did get rid of the moth-eaten grille cloth. The white grille cloth on both this and the third set are temporary and they'll be replaced by a more appropriate material shortly. The third set has four valves and being a battery powered set, this number is the equivalent of a mains powered five valve set. This set works though I find that it gives best performance when the B battery voltage is lowered slightly and a lengthy aerial and solid earth are used. All these sets have 150mm (6 inches on the old scale) loudspeakers and the sound quality is excellent. Note some of the minor differences between the receivers. Firstly, the dials, the first being plastic as mentioned before. The second and third are glass but they still have slightly different designs. 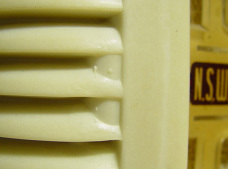 The large decoration between the knobs on the first set is merely a cover or 'blank' for the two extra knobs not required in this model. I am yet to see if this wide-dialled version was available with four knobs. Check the centre divider on the two bottom receivers. 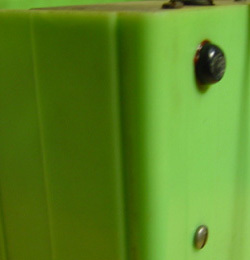 The first one is removable and has no decoration, indicating that the same cabinet could have also been used for the wide-dialled model above. Note how the wide-dialled version at the top has no fluting on its side decoration whereas the other two sets have three flutes on each side. The bottom set has fluting on its centre divider too and in this case, the divider is part of the cabinet. If you try to remove this one you'll need some Tarzan's Grip to put it back! 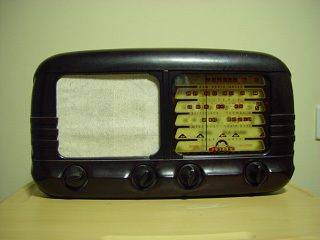 The receivers pictured here were among the last of the Bakelite radios made by AWA, infact anyone. 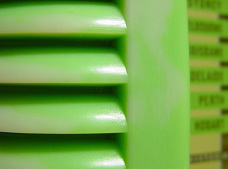 After this, coloured sets made of thermoplastics became common. Note: These photos highlight the two small badges which adorn each end of the tuning dial. The earlier set, probably around 1950/51 has brown lettering while the later model, probably 1952, has red lettering. These badges are illuminated by the dial lamps when the set is on. 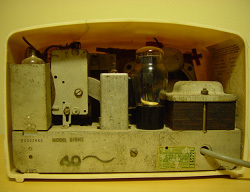 The later model has a valve line-up which includes one of the baseless nine pin valves which became commonly used from 1952 onwards. 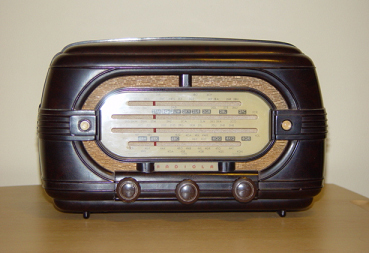 Before this, radio receivers used the Bakelite based 'octal' valves. Both of these sets have dials showing only stations in New South Wales and Queensland. I'd happily swap the later model for a set which has the stations from other states. Both these sets work well though one has a crack in the top of the cabinet. You'll see what I mean about lumps in a sec. They aren’t lumps as such but I cannot think of another name for them. I own two late 1940's Astor Mickeys. A white one which appears to be younger than the green one I also have. The green one has a glass dial and the white one has an ornate plastic one and yes it does have a crack in it. The heat of the valves and dial lamps was never kind to thermoplastics or nitro-cellulose which was the thin pearled material often used during the 1930's for dial backgrounds. NOTE: The funny looking additional formation of Bakelite near the dial seems to have no purpose. After an inspection of the innards, only the dial lamps are in the immediate vicinity, which is the case in the green set anyway. The white set was acquired from an antique shop in Concord, NSW, while the green set was a gift, in exchange for some electrical work I did for a chap in Tamworth, NSW. I have restored the white set though the green set is awaiting its turn at the 'laying on of hands'. Coloured Astor Mickeys can fetch high prices in antique shops because they are rare. The most common colour would be the standard mottled brown. Inside these two sets, once again the changes go further than skin-deep. Originally the 100mm loudspeaker was mounted on the port side and the sound came through slots in the side of the set, no visible unless you looked hard enough. 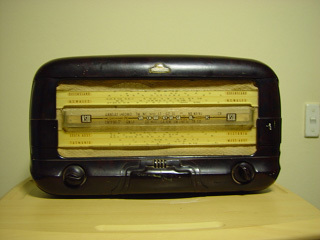 Later when plastic dials came into vogue the speaker was shifted to the front, mounted behind the dial in a similar way to the Radiolas featured above. There are 9 visitors on Vintage Radio now.